I had no idea I was going to add this new material until I stumbled across it trying to find something to upload today. 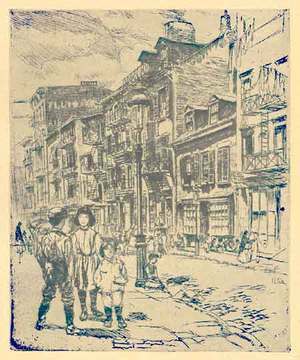 It's from an earlier issue of Harper's Monthly Magazine in the same year by Charles Henry White, this one entitled "in the Street." 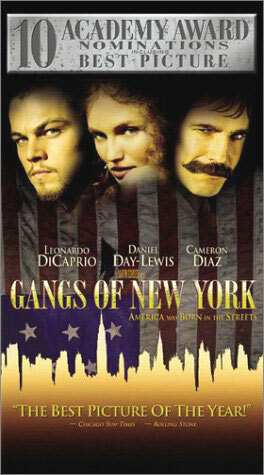 Just last night we were aware of a television channel running the film "Gangs of New York" and were reminded how much even a gifted director such as Martin Scorsese can go over the top with brutality and violence. 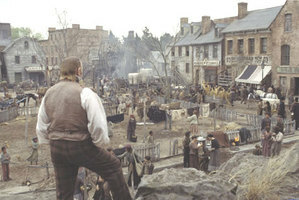 "Gangs" relates to the New York of the 1860s, whereas White's is that of four decades later and a much more peaceful environment. The main characters of the film. Click to enlarge these scenes from the film. Now let's get to White and his etchings. Click on the following images to enlarge them. "Five Points, the Mulberry Bend Region." From White's descriptive text: "At Mulberry Bend one has all the elements that go to make the charm of Thompson Street, only more elaborated and intensified a hundredfold. . . . At the 'Bend' everything is color. . . one has difficulty in realizing this indeed is New York. "Even the Piazza Colonna in Rome, noted for tis loungers, never in its palmiest days outnumbered the crowd of good-natured vagabonds that loiters here by the hour, sitting in a semidormant state on the benches in the sun . . . .
"Groups of men of all ages, in picturesque hats and nondescript clothes, form and reform on the corners or lean against the iron railings. The handsome Neapolitan with curling mustachios, in search of new conquests, and the tragic Sicilian in his great felt hat, with a suspicious air of the Mafia [So how would White know this?] about him, saunter past, going nowhere in particular. . . ."
Detail. "The Piazza is the home of all who reside near the Bend. They live here and dream away the hours. Perhaps a job may materialize tomorrow, or the day after? If it doesn't -- well, there's always the Piazza, lots of good company, and, what is more important, sunlight, and the great expanse of blue sky and flying clouds above. . . . After all, life on a park bench at the Bend is not half bad. 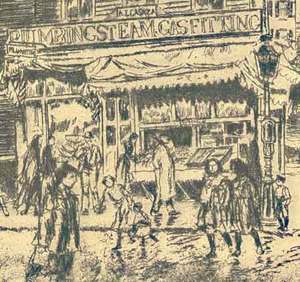 It is a cheerful devil-may-care sort of poverty, quite devoid of that hopelessly sordid atmosphere prevailing in Hester Street nearby." 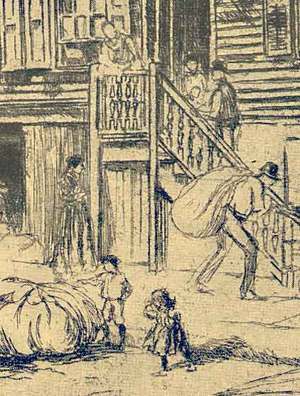 "Thompson Street, the home of the Ragpicker." White's commentary: "On one corner stands. . . the sign Thompson Street. 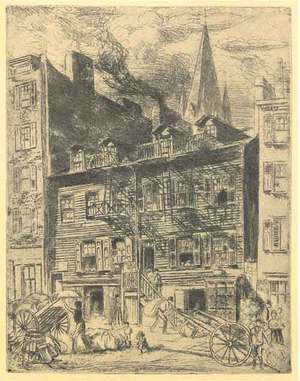 . . Great rows of tenements on either side, with their corroded iron fire-escapes festooned with vividly colored underwear; numerous push-carts overflowing with fruit and vegetables in a riot of brilliant color, surrounded by crowds of women in long black shawls bargaining over a few cents; little shops beneath dilapidated awnings with Italian bread and cheese, and prehistoric Salami sausages with green fur all over them; cigar-stores with vicious-looking things with straws stuck through them, such as you smoked in Venice -- only worse; and children everywhere -- in the gutter, on the doorsteps, crawling through the refuse, appearing behind ash-barrels, only to vanish again in the basements -- and you have Thompson Street." Detail. "It is necessary to go a few blocks before penetrating into the real atmosphere of this diminutive Italian colony. 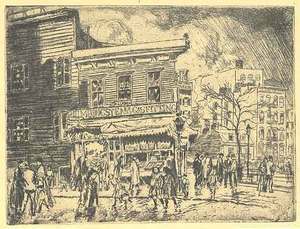 At noon, entering from Bleecker Street, the view is atrocious; but late in the afternoon, when the shadows lengthen and the tenements empty their inmates into the street, you see the real Thompson Street and confess that it is delightfully picturesque." Detail. I should wind this up with White's own words on what it was like to do etchings on site. "If there is anything the artist need fear in New York it is rather too much kindness than the contrary. 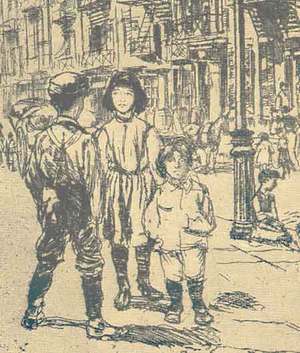 Everyone in the neighborhood is interested and kindly disposed towards him, from Casey the [cop,] who occasionally stops on his beat with a word of encouragement, and a little well chosen profanity -- accentuated by a prod or two from his night-stick to scatter the crowd -- to little Tommy Sullivan, who rushes to the drinking-water fountain a block away to replenish your water-bottle." ". . . . In Venice under the same conditions your audience of boys would be content to stand for hours in open-mouthed admiration at the mere fascination of the intricacies of your medium: at the rapidity with which your needle glides through the wax ground, laying bare the burnished copper. The American gamin is also impressed by this, but coupled with his admiration for mere manual dexterity and the mystery of strange mediums and processes, is a sane desire to put the whole matter on a purely commercial basis, and before long one is interrupted with, 'Say, mister; are you gettin' paid for doin' dis?' As a rule one has not time to reply before some intelligent boy answers for you: 'Shure! Wot de [expletive] do you t'ink de guy's doin' it fer -- fer his health?' "